This seminar invites students to examine the central ethical questions that arise in the everyday practice of medicine and to interpret those questions through a moral framework drawing from both natural law and medicine’s traditional orientation toward the patient’s health. This framework will be contrasted with principlism and consequentialism as participants consider what sort of practice medicine is, whether it has a rational end or goal, and how medicine contributes to human flourishing. 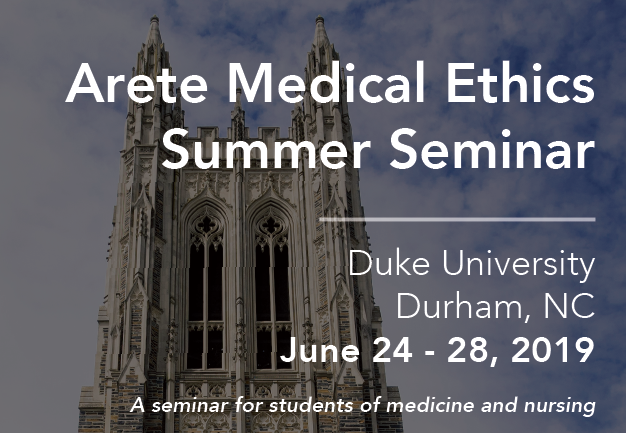 The seminar will consider common clinical ethical cases to examine perennial ethical concerns that arise in the practice of medicine, including: the nature of the clinician-patient relationship; the limits of medicine, the meaning of autonomy, the place of conscience in the physician’s work, the difference between an intended effect and a side effect, proportionality, human dignity, sexuality and reproduction, the beginning of life, disability, end-of-life care, and death. The purpose of the seminar is to equip participants with intellectual tools that can help physicians discern how to practice medicine well in the face of medicine’s clinical challenges and moral complexities. A $200 non-refundable registration fee will be required of all accepted students. All other expenses, including room and board for the duration of the seminar, are covered by the Arete Initiative. All applicants must submit the following forms and documents via e-mail to john.rose@duke.edu. Curriculum vitae or resume, including your nationality. Cover letter discussing the reasons for your interest in the seminar, an overview of any relevant experience in the seminar’s topic. Please explain how you found out about the seminar. Applications will be considered on a rolling basis until April 26th, 2019.